Product #55634 | SKU AC008-64G-RWE | 0.0 (no ratings yet) Thanks for your rating! 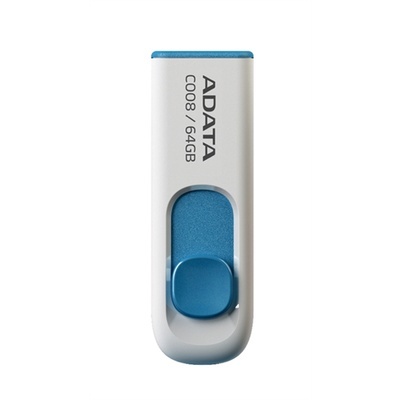 The sleek design of the ADATA C008 64GB Retractable USB 2.0 Flash Drive (White/Blue) features a sliding USB connector, which smoothly extends from the drive at the push of a thumb. The capless mechanical design eliminates the hassle of lost drive caps. The USB connector can be made ready for use with just one hand, for greater convenience when speed is a must.